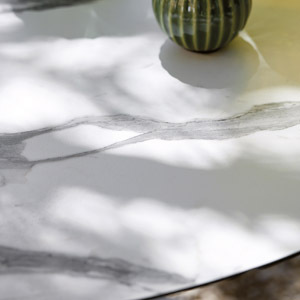 Because of its confidence in its expertise and quality control procedures, sifas® offers a 10 year warranty for home use from the date of purchase for all manufacturing defects of the furniture and a 2 year warranty for textile products and surface finishing. This warranty excludes normal wear and tear and the consequences of any inappropriate treatment, as well as damage by the buyer or third-parties. Sifas® may choose how to respond to the warranty claim, either by repair or replacement of the involved components. All other claims are excluded. 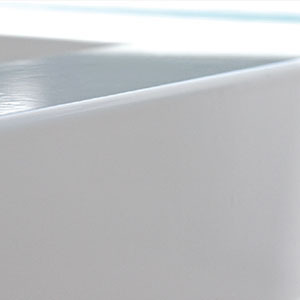 Sifas® products are designed using among the proven technologies, processes that ensure the best durability in the worst environment for each of the components including the screws, in accordance with our TT guarantee (UV, sea fog, water-humidity, freezing, natural chemical agents) resulting in simplicity of use and maintenance of the furniture by clients and fulfilling the criterion for long-lasting aesthetic appearance. 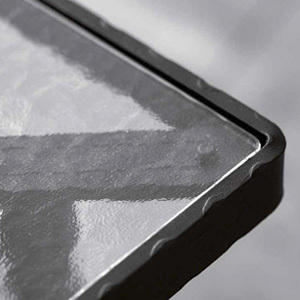 Pre-treatment that prepares the metal for a perfect powder-coated finish that is then baked on to ensure maximum resistance to the elements. 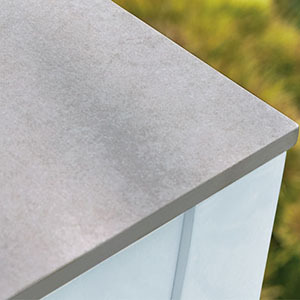 Exclusive technology combining cast aluminium pieces with aluminium edging for the authentic look of forged aluminium. Pre-treated, with a baked-on matte black finish. Liquid aluminium injected under pressure into a steel die. 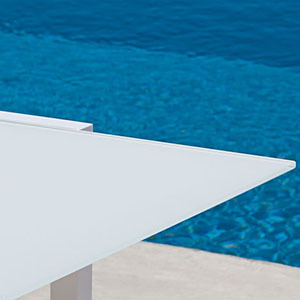 Glass tabletops are tempered at high temperatures and lacquered for optimum resistance to the elements. The glass is then washed with acid to produce a matte non-smudge surface that requires little care. 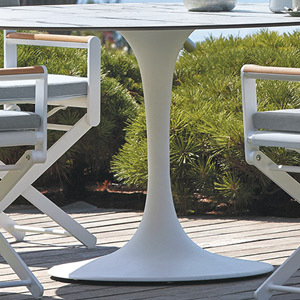 Grès Cérame technology provides a matte finish guaranteed for outdoor use that requires little care. Mass-extruded polyethylene in a blend of colours that reproduces the look of teak as closely as possible. Requires no care and is guaranteed for outdoor use. Panel composed of sheets of resin-impregnated kraft paper bonded at very high pressure. Faceted glass hammered and soaked to make it look more authentic and increase resistance. In case of a heavy impact, the glass breaks into thousands of small pieces, thus avoiding the handling of blunt glasses. Design printed on a film and implemented on aluminum. Firing in a kiln and lacquering at 200°C (392 °F) to ensure maximum resistance against external pressure. Polyester coated with a layer of PVC to repel water. 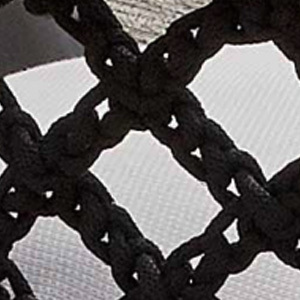 Material wrapped around a rubber core, creating a fast-drying fabric suitable for outdoor use. 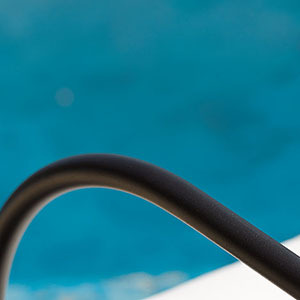 40 mm polyester bands coated with PVC for a water-repellent, fast-drying material. 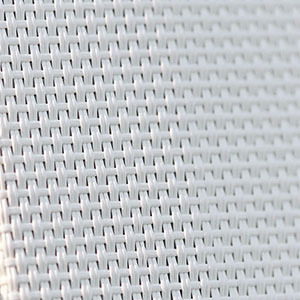 Woven PVC-coated polyester. 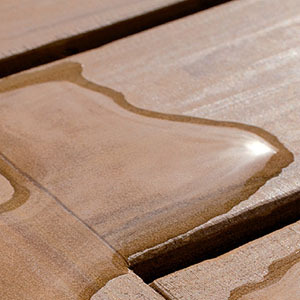 Easy-care, fast-drying material ideal for outdoor use. Weave consisting of 4 strands of polyester thread and reinforced by a second weave in polyester tube. For greater durability, good elasticity and quick drying. 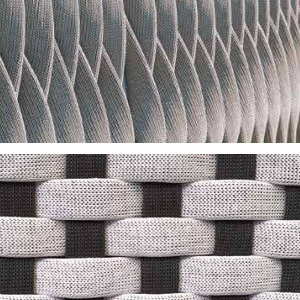 Polyester threads coated in PVC and then woven. 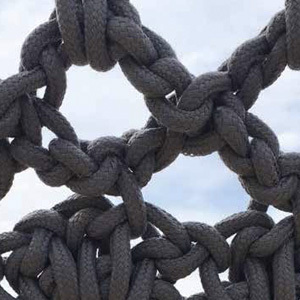 The tube obtained is in itself reinforced by a secondary tube weave. 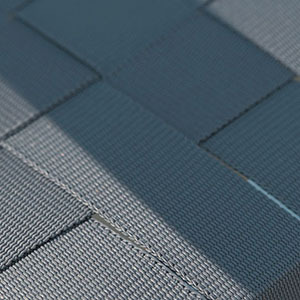 This creates greater durability, slight elasticity and water resistance. Polyurethane on a fabric base. 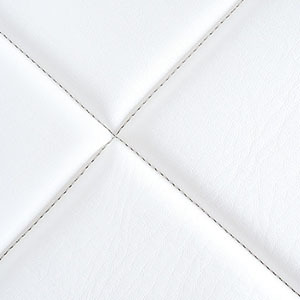 Marine-grade imitation leather for outdoor use. 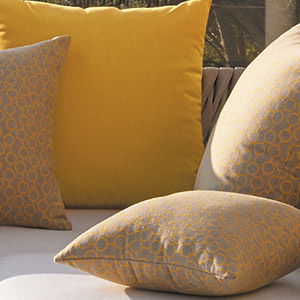 All our cushions come in easy-care Sunbrella® 100% acrylic fabrics that resist UV, water, stains, and mould. 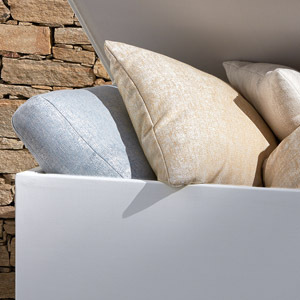 For questions on how to care for the materials, see: Clean Sunbrella Upholstery.